The Senate majority leader says it's “shocking” that Republicans are blocking Hagel. Really? What did he think would happen when he blocked filibuster reform? 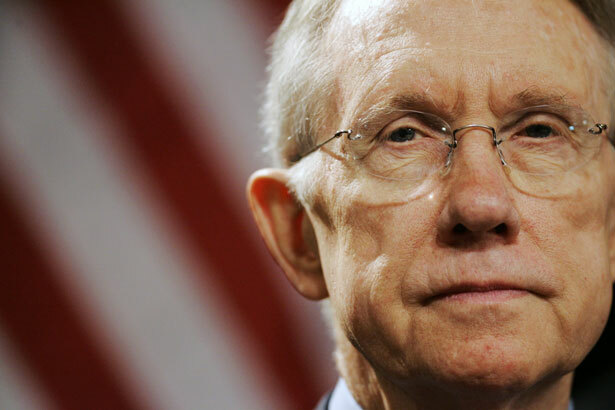 Senate Majority Leader Harry Reid on Thursday was shocked to learn that there was filibustering going on in the Senate. “It is shocking that our Republicans colleagues would leave our nation without a secretary of defense with all the things going on and when we’re in a war,” Reid said after Senate Republicans voted against confirming former Republican Chuck Hagel as the new head of the Pentagon. It was “shocking”—if we use the definition of the word as “troubling” or “unsettling”—that fifty-eight senators (the members of the Democratic caucus and four Republicans: Senators Thad Cochran of Mississippi, Susan Collins of Maine, Mike Johanns of Nebraska and Lisa Murkowski of Alaska) out of 100 wanted a vote but could not get it. But it was not “shocking”—if we use the definition of the word as “surprising” or “unexpected”—that a Republican minority was again obstructing action in the Senate. Seriously! What did Harry Reid think was going to happen when he rejected the calls of Senators Jeff Merkley, D-Oregon, and Tom Udall, D-New Mexico, for filibuster reform? What Merkley, Udall and a number of other senators have been proposing for several years now is the restoration of the tradition filibuster where, as in Mr. Smith Goes to Washington, a dissenting senator must hold the floor and make the case—the very long case, at least in some instances—against a nomination or a bill. But Reid fumbled filibuster reform again last month, at the start of the new Congress, reaching another gentleman’s agreement to make minor tinkers around the edges of the process—rather than adopt the meaningful reforms proposed by Merkley, Udall, Iowa Senator Tom Harkin, Massachusetts Senator Elizabeth Warren and a rapidly growing caucus within his caucus. Now, Reid is frustrated again. He could have implemented filibuster reform with a simple majority in January—as the Senate is allowed to make changes in how it operates at the start of each new Congress. Now, he needs sixty-seven votes, and he won’t get them. So he’s stuck, as is the Senate, as is the republic that voted in November to end the dysfunction in Washington. Read George Zornick’s primer on Reid and Hagel.